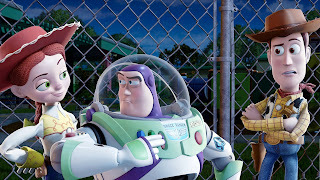 A full fifteen years after the original Toy Story was released, and eleven years after the first sequel, Pixar and Disney release the third episode in the animated story of the toys Woody, Buzz, and their friends. It's a worthy installment, mixing humour with honest sentiment, and a message of friendship, trust, and eternal hope for a better future. Andy, the owner of Woody (voiced by Tom Hanks), Buzz Lightyear (Tim Allen) and other favourite toys like Mr.and Mrs. Potato Head, Jessie the cowgirl, Rex the dinosaur, Hamm the Pig and Slinky Dog, is now 17 years old and on his way to college. The toys know that the old days of Andy playing with them are long gone; they are worried that they might be thrown out, and the best that they can hope for is retirement in the attic. Through a series of unfortunate events the toys find themselves donated to a daycare, where a toy bear (Ned Beatty) and his goons have established rigid rules, insisting that the newcomers play with toddlers too young to treat them with care. Woody has to help his friends escape from the abuse at the daycare, and in the course of the madcap adventure he also stumbles upon a solution to their long-term future. Toy Story 3 is made more poignant since the core child audience of the original 1995 movie, who purchased the Woody and Buzz merchandise at the time, have grown up and outgrown the toys just as Andy has. The film poses questions about loyalty, kindness and friendship in terms simple enough for a new generation of young kids to ponder, within the framework of a story enjoyable by the teenagers of today and the parents of both generations. The animation technology gets ever better, and now the toys look rigid only because they are toys, and not through the limits of technology. The fluid motion, light and shadows, and background details are perfected to the point where the animation is almost forgotten, a scary yet brilliant achievement. Lee Unkrich, who co-directed Toy Story 2 with John Lasseter, takes over full directing duties this time while Lasseter keeps an eye on things as Executive Producer. Unkrich finds all the interesting angles to film the misadventures of the toys, and he is helped by the appropriately over the top voice acting performances of Tom Hanks and Tim Allen. Toy Story 3 is a visit from old friends for one more round of laughs and tears, and a realization that while times may change, true friendships are forever.